Hawthorne berries, popular with Europeans who use the berries for herbal blends and teas, provide powerful benefits for the circulatory system. The ingredients in hawthorne berries have been shown in studies to promote the health of the heart muscle as well as circulatory health. 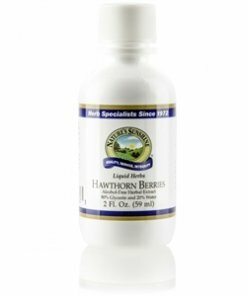 Nature’s Sunshine Hawthorn Berries Extract is easily and quickly assimilated by the body and can be administered directly or mixed with another liquid. Instructions: Take approximately 15-20 drops (1 ml) in water with a meal twice daily. One ml is equal to two capsules of hawthorn berries.